Yikes. I knew it would be bad, but the latest Morningstar Investor Returns data look downright ugly. 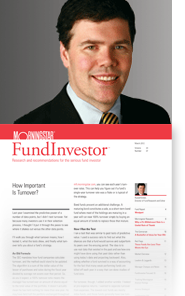 Investor returns is Morningstar's measure of the actual returns that fund investors enjoyed. We take a fund's stated return and then adjust for inflows and outflows so that we have a measure of how the typical investor really fared. We then asset-weight investor returns. After all, $20 billion moving in or out of PIMCO Total Return (PTTRX) should count for more than $200,000 moving in or out of Beech Hill Total Return (BHTAX). Over the past 10 years, flows were headed in the wrong direction at a couple of key junctures. In 2009, money flew out of stock funds, but that proved to be the bottom of the market and a great spot to get in. Some investors were also leaning the wrong way in 2012 and 2013. The 10-year gap between the average investor and the average fund ballooned to 2.49% by the end of 2013 from 0.95% at the end of 2012. In sum, the typical investor gained 4.8% annualized over the 10 years ended December 2013 versus 7.3% for the typical fund. The biggest gaps were in sector funds and international equity. That's not surprising, as more-volatile funds tend to lead to bigger gaps. But even relatively sedate bond funds suffered big gaps. Taxable-bond investors had a 2.2% annualized gap and muni investors a 1.9% gap. United States equity funds had the smallest gap of 1.6%, meaning investors got the best returns from U.S. equities. The typical investor earned a 6.5% annualized return with his U.S.-stock funds. The worst investor return came in alternatives, where the typical investor actually lost 1.15% annualized. Perhaps "alternative" refers to the alternative to retiring. The average total return for alts funds was a meager 0.96%, so it seems that choosing alts at all was a bigger mistake than the timing of when to buy and sell. The biggest gaps were in international and sector funds, where the gaps were more than 300 basis points, though the typical investor at least enjoyed respectable returns even after those gaps. Sector investors had a return of 6.32%, and international investors had a return of 5.76%. I knew it wouldn't be pretty, because fund flows were going in all the wrong directions entering 2013. Investors were buying bond funds, selling U.S.-stock funds, and buying emerging markets. We know now that that was exactly wrong. Bond funds got smacked by rising rates, emerging markets got stung by slowing China growth and the looming Fed taper, and U.S. equities had their greatest year in a generation. That's not to say that most people were going the wrong direction. In fact, most fund investors are rather patient folks who don't make big moves from year to year. But those who did once more showed how hard it is to time the markets. As Morningstar's vice president of research John Rekenthaler has pointed out, people actually tend to select good funds. But their timing in moving among asset classes tends to stink. We saw massive inflows to intermediate-bond funds in 2012 just before one of their worst years in the past 40 years. It's sort of like the way we saw huge inflows to equity funds in 2000 or huge redemptions in 2009--too much rearview-mirror driving. In fact, selling in 2008 and 2009 was much more devastating than selling in 2013. A $10,000 investment in Vanguard Total Stock Market Index (VTSMX) on March 9, 2009, would be worth more than $31,000 today. Going the wrong direction then looks like a bigger mistake after a great 2013. Another part to the deteriorating 10-year gap is that it now begins in the rebound from the 2000-02 bear market. Generally big pivot years for the markets lead to the worst timing. Investors sell after a bear market and buy after a bull market even though that's contrary to buying low and selling high. Oddly, though, that suggests investors should have been buying U.S.-stock funds in late 2012 and early 2013. After all, equities had just about doubled from the early 2009 lows. We've seen a shift, though, from chasing performance to chasing TV news coverage. So many people were getting the message that the U.S. economy was doomed and the Chinese economy was ascendant that they invested that way even when their monthly brokerage statements were telling a different story. 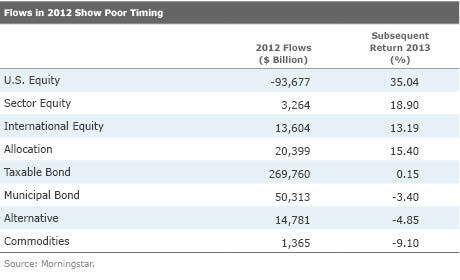 However, flows in 2013 did sometimes reflect performance. People turned against high-quality bond funds and precious-metals funds when those groups posted losses around midyear. The data tell a tale of poor timing, and it seems to be getting worse. I suspect the 24-hour news cycle inundates us with news and opinions leading to investing based on anxiety rather than logic. Although the causes of bad timing are complicated, the solution doesn't have to be. Rebalancing is a great way to counteract the temptation to invest emotionally. When you rebalance, you are buying low and selling high because you are culling winning investments and adding cheaper investments. And there are more ways than ever to rebalance. You can buy a balanced fund with fixed allocation or a target-date fund that regularly resets to a glide path. For example, Vanguard Tax-Managed Balanced (VTMFX) and Vanguard Balanced Index (VBIAX) maintain precise stock/bond splits. You can also set up automated rebalancing in many 401(k)s and other accounts. For example, I have my 401(k) set up to rebalance annually. Because it's tax-sheltered, you don't have to worry about triggering capital gains. In a taxable account, you might tolerate wider bands of asset mixes and only rebalance when your allocation exceeds those levels. Financial planners and brokers will also rebalance for you. In the bigger picture, though, the way to avoid letting fear or greed drive your decisions is to develop a robust plan and stick to it. If you understand why you own what you own, you're much less likely to panic when you hit turbulence. Christine Benz, Morningstar's director of personal finance, advocates the bucket approach because it's a way of walling off assets for each need. If your short-term bucket has low-risk fixed income, an equity sell-off will be less unsettling. You keep your equities in a long-term retirement bucket, and it's easier to hold on when the market tanks. Don't spend too much time watching TV news or checking your accounts. It only leads to bad behavior. Who cares if a talking head predicts gold will surge and stocks will tank? Focus on your needs and goals. As the data show, timing markets is too difficult, so have faith in your plan and carry on regardless, as Jack Bogle likes to say. Russel Kinnel has a position in the following securities mentioned above: PTTRX. Find out about Morningstar's editorial policies.